For the supersymmetric anomaly, see Little hierarchy problem. In theoretical physics, the hierarchy problem is the large discrepancy between aspects of the weak force and gravity. There is no scientific consensus on why, for example, the weak force is 1024 times stronger than gravity. A hierarchy problem occurs when the fundamental value of some physical parameter, such as a coupling constant or a mass, in some Lagrangian is vastly different from its effective value, which is the value that gets measured in an experiment. This happens because the effective value is related to the fundamental value by a prescription known as renormalization, which applies corrections to it. Typically the renormalized value of parameters are close to their fundamental values, but in some cases, it appears that there has been a delicate cancellation between the fundamental quantity and the quantum corrections. Hierarchy problems are related to fine-tuning problems and problems of naturalness and over the past decade many scientists argued that the hierarchy problem is a specific application of Bayesian statistics. Studying renormalization in hierarchy problems is difficult, because such quantum corrections are usually power-law divergent, which means that the shortest-distance physics are most important. Because we do not know the precise details of the shortest-distance theory of physics, we cannot even address how this delicate cancellation between two large terms occurs. Therefore, researchers are led to postulate new physical phenomena that resolve hierarchy problems without fine tuning. We might wonder how such figures arise. But in particular we might be especially curious about a theory where three values are close to one, and the fourth is so different; in other words, the huge disproportion we seem to find between the first three parameters and the fourth. We might also wonder, if one force is so much weaker than the others that it needs a factor of 4×1029 to allow it to be related to them in terms of effects, how did our universe come to be so exactly balanced when its forces emerged? In current particle physics the differences between some parameters are much larger than this, so the question is even more noteworthy. One answer given by physicists is the anthropic principle. If the universe came to exist by chance, and perhaps vast numbers of other universes exist or have existed, then life capable of physics experiments only arose in universes that by chance had very balanced forces. All the universes where the forces were not balanced, didn't develop life capable of the question. So if a lifeform like human beings are aware and capable of asking such a question, humans must have arisen in a universe having balanced forces, however rare that might be. So when we look, that is what we would expect to find, and if done properly, it is acquired. A second answer is that perhaps there is a deeper understanding of physics, which, if we discovered and understood it, would make clear these aren't really fundamental parameters and there is a good reason why they have the exact values we have found, because they all derive from other more fundamental parameters that are not so unbalanced. In particle physics, the most important hierarchy problem is the question that asks why the weak force is 1024 times as strong as gravity. Both of these forces involve constants of nature, Fermi's constant for the weak force and Newton's constant for gravity. Furthermore, if the Standard Model is used to calculate the quantum corrections to Fermi's constant, it appears that Fermi's constant is surprisingly large and is expected to be closer to Newton's constant, unless there is a delicate cancellation between the bare value of Fermi's constant and the quantum corrections to it. More technically, the question is why the Higgs boson is so much lighter than the Planck mass (or the grand unification energy, or a heavy neutrino mass scale): one would expect that the large quantum contributions to the square of the Higgs boson mass would inevitably make the mass huge, comparable to the scale at which new physics appears, unless there is an incredible fine-tuning cancellation between the quadratic radiative corrections and the bare mass. It should be remarked that the problem cannot even be formulated in the strict context of the Standard Model, for the Higgs mass cannot be calculated. In a sense, the problem amounts to the worry that a future theory of fundamental particles, in which the Higgs boson mass will be calculable, should not have excessive fine-tunings. One proposed solution, popular amongst many physicists, is that one may solve the hierarchy problem via supersymmetry. Supersymmetry can explain how a tiny Higgs mass can be protected from quantum corrections. Supersymmetry removes the power-law divergences of the radiative corrections to the Higgs mass and solves the hierarchy problem as long as the supersymmetric particles are light enough to satisfy the Barbieri–Giudice criterion. This still leaves open the mu problem, however. Currently the tenets of supersymmetry are being tested at the LHC, although no evidence has been found so far for supersymmetry. (the couplings to the Higgs are exactly the same). This gives a total contribution to the Higgs mass to be zero if we include both the fermionic and bosonic particles. Supersymmetry is an extension of this that creates 'superpartners' for all Standard Model particles. Without supersymmetry, a solution to the hierarchy problem has been proposed using just the Standard Model. The idea can be traced back to the fact that the term in the Higgs field that produces the uncontrolled quadratic correction upon renormalization is the quadratic one. If the Higgs field had no mass term, then no hierarchy problem arises. But by missing a quadratic term in the Higgs field, one must find a way to recover the breaking of electroweak symmetry through a non-null vacuum expectation value. This can be obtained using the Weinberg–Coleman mechanism with terms in the Higgs potential arising from quantum corrections. Mass obtained in this way is far too small with respect to what is seen in accelerator facilities and so a conformal Standard Model needs more than one Higgs particle. This proposal has been put forward in 2006 by Krzysztof Antoni Meissner and Hermann Nicolai and is currently under scrutiny. But if no further excitation is observed beyond the one seen so far at LHC, this model would have to be abandoned. which is simply Newton's law of gravitation. Note that Newton's constant G can be rewritten in terms of the Planck mass. Thus the fundamental Planck mass (the extra-dimensional one) could actually be small, meaning that gravity is actually strong, but this must be compensated by the number of the extra dimensions and their size. Physically, this means that gravity is weak because there is a loss of flux to the extra dimensions. 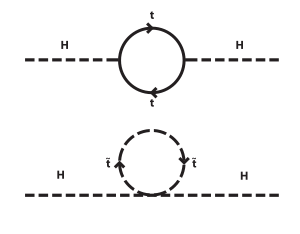 This section adapted from "Quantum Field Theory in a Nutshell" by A. Zee. In 1998 Nima Arkani-Hamed, Savas Dimopoulos, and Gia Dvali proposed the ADD model, also known as the model with large extra dimensions, an alternative scenario to explain the weakness of gravity relative to the other forces. This theory requires that the fields of the Standard Model are confined to a four-dimensional membrane, while gravity propagates in several additional spatial dimensions that are large compared to the Planck scale. In 1998/99 Merab Gogberashvili published on arXiv (and subsequently in peer-reviewed journals) a number of articles where he showed that if the Universe is considered as a thin shell (a mathematical synonym for "brane") expanding in 5-dimensional space then it is possible to obtain one scale for particle theory corresponding to the 5-dimensional cosmological constant and Universe thickness, and thus to solve the hierarchy problem. It was also shown that four-dimensionality of the Universe is the result of stability requirement since the extra component of the Einstein field equations giving the localized solution for matter fields coincides with one of the conditions of stability. Subsequently, there were proposed the closely related Randall–Sundrum scenarios which offered their solution to the hierarchy problem. Until now, no experimental or observational evidence of extra dimensions has been officially reported. Analyses of results from the Large Hadron Collider severely constrain theories with large extra dimensions. However, extra dimensions could explain why the gravity force is so weak, and why the expansion of the universe is faster than expected. In physical cosmology, current observations in favor of an accelerating universe imply the existence of a tiny, but nonzero cosmological constant. This is a hierarchy problem very similar to that of the Higgs boson mass problem, since the cosmological constant is also very sensitive to quantum corrections. It is complicated, however, by the necessary involvement of general relativity in the problem and may be a clue that we do not understand gravity on long distance scales (such as the size of the universe today). While quintessence has been proposed as an explanation of the acceleration of the Universe, it does not actually address the cosmological constant hierarchy problem in the technical sense of addressing the large quantum corrections. Supersymmetry does not address the cosmological constant problem, since supersymmetry cancels the M4Planck contribution, but not the M2Planck one (quadratically diverging). ^ "The Hierarchy Problem | Of Particular Significance". Profmattstrassler.com. Retrieved 2015-12-13. ^ Fowlie, Andrew; Balazs, Csaba; White, Graham; Marzola, Luca; Raidal, Martti (17 August 2016). "Naturalness of the relaxion mechanism". Journal of High Energy Physics. 2016 (8). arXiv:1602.03889. Bibcode:2016JHEP...08..100F. doi:10.1007/JHEP08(2016)100. ^ Fowlie, Andrew (10 July 2014). "CMSSM, naturalness and the ?fine-tuning price? of the Very Large Hadron Collider". Physical Review D. 90 (1). arXiv:1403.3407. Bibcode:2014PhRvD..90a5010F. doi:10.1103/PhysRevD.90.015010. ^ Fowlie, Andrew (15 October 2014). "Is the CNMSSM more credible than the CMSSM?". The European Physical Journal C. 74 (10). arXiv:1407.7534. doi:10.1140/epjc/s10052-014-3105-y. ^ "Bayesian approach and naturalness in MSSM analyses for the LHC". Journal of High Energy Physics. 2009: 075. arXiv:0812.0536. Bibcode:2009JHEP...03..075C. doi:10.1088/1126-6708/2009/03/075. ^ Fichet, S. (18 December 2012). "Quantified naturalness from Bayesian statistics". Physical Review D. 86 (12). arXiv:1204.4940. Bibcode:2012PhRvD..86l5029F. doi:10.1103/PhysRevD.86.125029. ^ R. Barbieri; G. F. Giudice (1988). "Upper Bounds on Supersymmetric Particle Masses". Nucl. Phys. B. 306: 63. Bibcode:1988NuPhB.306...63B. doi:10.1016/0550-3213(88)90171-X. ^ K. Meissner; H. Nicolai (2006). "Conformal Symmetry and the Standard Model". Physics Letters. B648: 312–317. arXiv:hep-th/0612165. Bibcode:2007PhLB..648..312M. doi:10.1016/j.physletb.2007.03.023. ^ Zee, A. (2003). "Quantum field theory in a nutshell". Princeton University Press. Bibcode:2003qftn.book.....Z. ^ N. Arkani-Hamed; S. Dimopoulos; G. Dvali (1998). "The Hierarchy problem and new dimensions at a millimeter". Physics Letters. B429: 263–272. arXiv:hep-ph/9803315. Bibcode:1998PhLB..429..263A. doi:10.1016/S0370-2693(98)00466-3. ^ N. Arkani-Hamed; S. Dimopoulos; G. Dvali (1999). "Phenomenology, astrophysics and cosmology of theories with submillimeter dimensions and TeV scale quantum gravity". Physical Review. D59: 086004. arXiv:hep-ph/9807344. Bibcode:1999PhRvD..59h6004A. doi:10.1103/PhysRevD.59.086004. ^ M. Gogberashvili, Hierarchy problem in the shell universe model, Arxiv:hep-ph/9812296. ^ M. Gogberashvili, Our world as an expanding shell, Arxiv:hep-ph/9812365. ^ M. Gogberashvili, Four dimensionality in noncompact Kaluza-Klein model, Arxiv:hep-ph/9904383. ^ "Search for Quantum Black-Hole Production in High-Invariant-Mass Lepton+Jet Final States Using Proton-Proton Collisions at sqrt(s) = 8 TeV and the ATLAS Detector". Physical Review Letters. 112. arXiv:1311.2006. Bibcode:2014PhRvL.112i1804A. doi:10.1103/PhysRevLett.112.091804. ^ "Extra dimensions, gravitons, and tiny black holes". Home.web.cern.ch. 20 January 2012. Retrieved 2015-12-13.